Why MySQL so popular in web? Before knowing about MySQL, it's better to clear the concept of what a "database" means. So, generally, a database is just a collection of data. Specialized database software is just programs that let you store and retrieve that data as efficiently as possible. It stored and accessed electronically from a computer system. Where databases are more complex they are often developed using formal design and modeling techniques. Access to this data is usually provided by a "database management system" (DBMS) consisting of an integrated set of computer software that allows users to interact with one or more databases and provides access to all of the data contained in the database. MySQL is the most popular database in the world. There are many powerful features in this database that are available for absolutely free. MySQL is an open-source relational database management system. The MySQL development project has made its source code available under the terms of the GNU General Public License, as well as under a variety of proprietary agreements. MySQL is roughly 10 years old. That means it was started in the late 90s. This was right about the time that everyone decided that they could have a website. MySQL ties nicely into the explosion of the internet. Thousands of static websites are popping up every day. And, small web hosting companies are starting to take hold. The competition among the regional web hosts leads them to expand their offerings and, at the same time, websites are struggling to differentiate themselves. 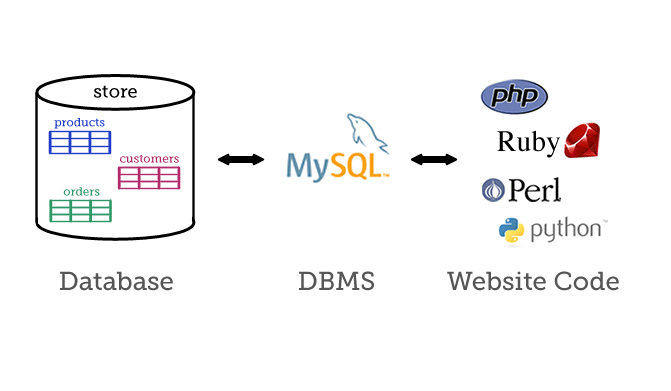 While the majority of sites are still static content, many require a small backend database. MySQL is the ONLY FREE database around. MySQL becomes the default install in many of these web hosting companies. As tools for building sites become more popular MySQL is the only viable choice. It was also much easier to get started learning MySQL. Getting it running out of the box and connecting as a default user was so simple anyone could do it. MySQL is one of the most used databases on the planet. Many extremely popular open source platforms like Wordpress and Drupal use MySQL. One of the most regular app development services in the IT field is the MySQL development. The question is - Why MySQL so popular in the web? It is free, which means it sees more use on personal projects as well as on hosting platforms that provide a DBMS solution. It is one of the few solutions that can run on almost any operating system. It uses basic SQL rather than a specialized variant, meaning that it requires less-specialized knowledge to use. Setup and configuration are more straightforward and less time-consuming than most other options. Query caching and full-text indexing and searching. The sources are available on both the native MySQL site and their GitHub repository. It is distributed under the Apache license (or GPL v2) and is represented as a single PHP file. Works rapidly and functions admirably even with huge informational collections. Databases Workbench supports multiple database systems, includes cross-database tools and thus provides single GUI for multiple projects if needed. MySQL has a huge community of freelance developers. There is a good size online support community. Can be connected to any programming language easily. Reduced the cost of ownership.